Betz and I met long ago in a blogging galaxy far, far away, and have been friends ever since. An inspiration and true talent, and I wish we could share some cupcakes in person! These embroidered and appliqued cards are a fun, handmade touch for any occasion. 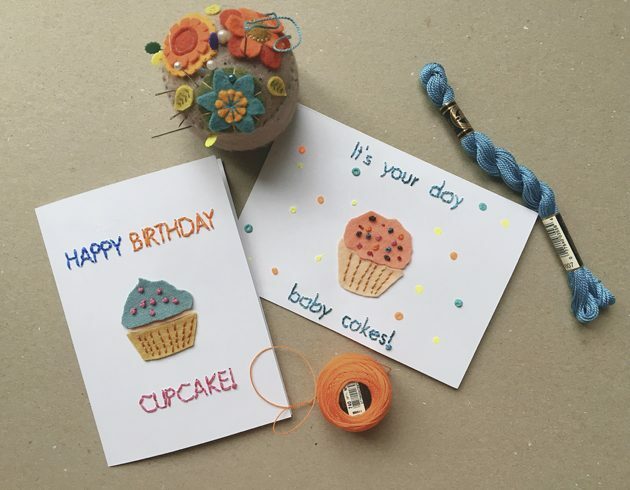 And in an age of gift cards and online gift ordering, who wouldn’t love a handmade card? Perle cotton embroidery thread to embroider with. A crewel needle with a sharp point. 1. Print out the templates. Place the words on the card where you would like them (I used washi tape to hold them down.) Open up the card and place it on a cutting mat. Using the gray dots as a guide, pre-punch holes through the front of the card with an awl. 2. Embroider the letters using a backstitch. 3. Cut out the felt cupcake using the template pieces. Glue it onto the center of the card with a tiny bit of glue. 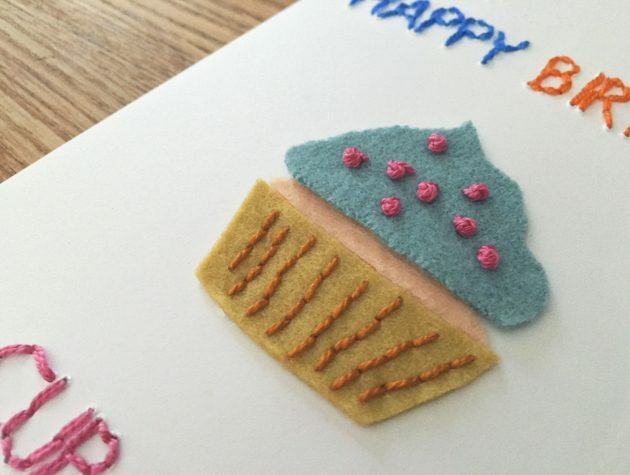 I did not prepunch holes, but backstitched the lines to define the cupcake liner paper, and used french knots in different colors for the “sprinkles” on the frosting. These stitches will go through all layers and hold the applique shapes onto the card. 4. I added a few dots of glitter, because some things just need glitter! I also covered the inside of the front with strips of pretty washi tape to hold/hide the back of my embroider. Thanks for this cute and easy project, Blair! To see more from Blair visit her blog, website and shop!